Albert Needed To Drop A Little Extra Cash To Finish His Dream Come True '62. 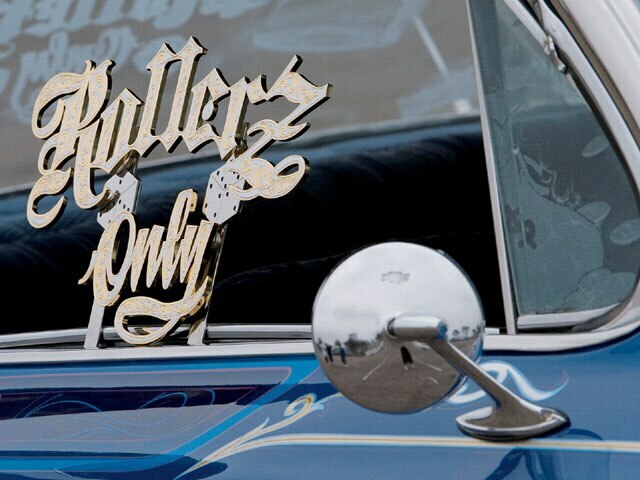 When Albert Casillas of Kerman, California, was growing up he always dreamed about owning a lowrider that he could cruise in the streets and display at lowrider car shows all over Cali. Albert’s dream started to come true when his brother-in-law told him about a “hidden treasure” that was for sale. Albert discovered a clean ‘62 Chevy Impala that needed a little bit of love from a lowrider car builder with heart. The car was purchased on the 4th of July back in 2002 and its rebirth began. Albert’s plan was to take the ’62 to a body shop and have it stripped, straightened and painted. Unfortunately, this plan was smashed not once but twice when the first two painters couldn’t get the job done. After three years of chasing down different painters, he found Josh who was able to get the job done right and in a timely manner. So the car was finally painted and then it was time to get important pieces chrome- and gold-plated. All of the parts that needed to get plated were sent to Mexicali, Mexico, with some later work done at Morris Chroming in Fresno, California. When the car was completed, Albert got a chance to cruise and show it at countless car shows, where it’s taken first place in its class, best engine and best undercarriage awards at shows all over Cali. 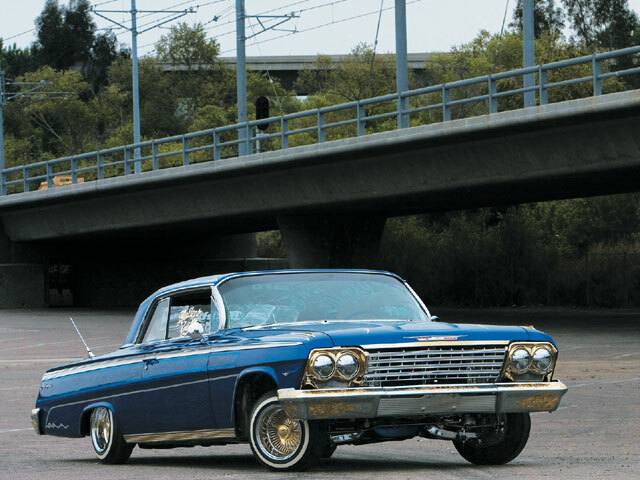 Albert is finally living his dream of owning a lowrider, but it did take lots of time and money, as well as the love and support of his family, especially his wife and kids, along with his homies Frederico and the twins for always lending a helping hand in making this dream come true. Engine/Drivetrain: The stock 327-c.i.d. 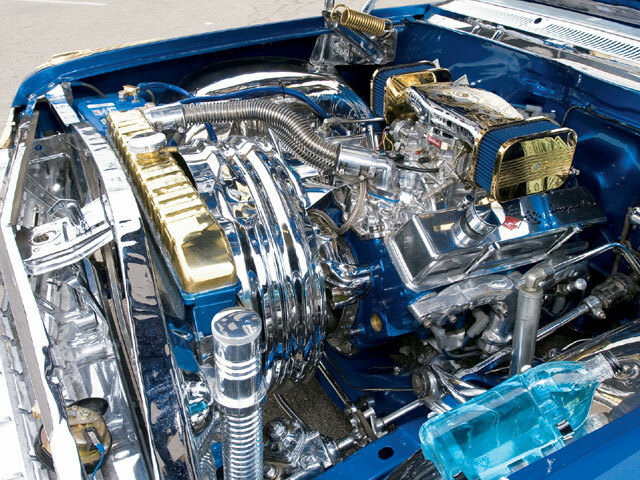 engine built by Mac’s Equipment in Kerman was lavished with tons of chrome and a bunch of extra parts that dress it up nicely. Salas Engraving in Los Angeles, California, set up the engine with engraved oil covers. Body/Paint: Josh from Josh Extreme in Fresno, California, took the car into his hands and molded the firewall, had the frame powdercoated at Caps in Fresno, and added graphics, marble and clearcoat to the car after the candy blue paint was done. The car was also pinstriped by “The Kid” from Fresno. Interior: The interior was gutted by Mario Morales of Mario’s Upholstery in Fresno and set up with tuck and roll and biscuits on front swivel buckets and a rear loveseat in a color-matching hue. Sound System. J’s Alarms in Fresno hooked up a head unit/CD player with three amps and two crossovers that power two 12-inch subs and four tweeters. There’s also three monitors and a DVD player. 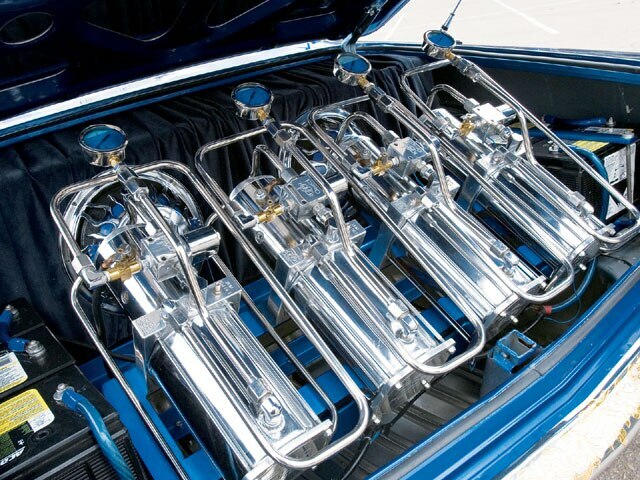 Setup: “Sunny” in Selma, California, built a custom powdercoated pump rack that lifts out of the trunk to reveal a four-pump setup with custom-bent chrome-plated hard-lines. Six batteries provide the power and 10 switches the control.